22 June 2010 - Doha, QATAR – Qatar Airways today announced its expansion programme was continuing with vigour with plans to launch six new routes in Europe and Asia from October 2010. The Doha-based airline will phase in the route expansion over a four-month period with daily flights to Phuket – after Bangkok, its second destination in Thailand – kicking off the growth drive on October 11. The new flights will operate via Kuala Lumpur. Three weeks later, beginning November 1, Qatar Airways adds the Vietnamese capital Hanoi to its network with four flights a week via Bangkok. The new route will support existing services to Vietnam’s commercial centre and largest city of Ho Chi Minh City, where flights will also be stepped up from four-a-week to daily. November 24 marks the launch of the carrier’s European expansion drive with thrice-weekly flights to the French Mediterranean city of Nice. Operating via Milan, the Nice operation will strengthen Qatar Airways’ services to France, where it already operates to the capital Paris. The New Year sees Qatar Airways’ entry into eastern Europe with the launch of four flights a week to the Romanian capital of Bucharest, starting on January 17. The services continue on to Budapest, capital city of Hungary. And with five flights a week from January 31, the Belgian capital of Brussels, home of the European Parliament, rounds off an impressive list of destinations for the airline, which has maintained its strategy of opening exciting new routes around the world since launching just 13 years ago. 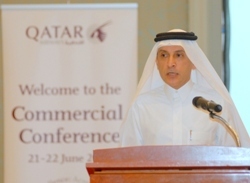 Announcing the expansion at the airline’s annual commercial conference in the Qatari capital Doha today, Qatar Airways Chief Executive Officer Akbar Al Baker spoke of the carrier’s commitment to develop its route network far and wide from its hub. “Qatar Airways’ track record to grow remains strong and solid,” he said. “The airline is well positioned globally, focusing on a long term strategy that is forward thinking and not one to look back on. “Budapest, Bucharest, Brussels, Nice, Hanoi and Phuket represent markets underserved so these are excellent opportunities for us to tap into. This week – starting June 24 – Qatar Airways introduces South America into the airline’s family of routes with the launch of flights to the Brazilian city of Sao Paulo and Argentine capital Buenos Aires. South America represents the latest destination for Qatar Airways this year. Over the past six months, the carrier has introduced flights to Bengaluru (Bangalore), Copenhagen, Ankara, Tokyo and Barcelona.